The Rockport Film Review: The Adam Green Trilogy #1 - "Hatchet"
The Adam Green Trilogy #1 - "Hatchet"
My next three reviews will focus on the extremely talented young writer/director Adam Green. Adam is apart of a group of New England born and bred filmmakers who seem to be taking the independent horror genre by storm. Guys like Eli Roth, Paul Solet, Joel David Moore and others have been involved in some of the best horror movies in years. These filmmakers are movie fanatics in their own right and create films with their fan base in mind. Adam Green’s breakout hit was the 2006 slasher spectacle “Hatchet” that tells the story of Victor Crowley, a viciously deformed killer that stalks the New Orleans bayou. 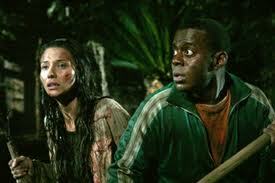 For his first big film, Green was able to corral a horror director’s dream of a cast. Robert Englund of Freddy Krueger fame opens the movie, playing an alligator hunter, who is out with his son when the run into some trouble with Victor. Kane Hodder, who was “Jason” in a handful of the Friday the 13th movies, plays Victor Crowley. He also doubles as Victor’s father in a flashback. Horror icon Tony Todd of “Candyman” fame also has a cameo as Reverend Zombie. The plot of “Hatchet” follows a bunch of college kids at Mardi Gras. Ben, played by Joel David Moore gets sick of all the drunken debauchery around him and leaves the group with one his best friends Marcus coming along. Looking for some cheap thrills they board a pontoon boat with an eclectic group of people for a haunted swamp tour of the bayou. Although the story of Victor Crowley and the woods setting is quite similar to Jason and the Friday movies, Green does do his best to differentiate them. There are homage’s to other classic horror films that only fans will recognize. A line here a scene there, it's all pretty subtle. Green knows his audience and fan base well because he is one of them. The kills and gore effect are pretty spectacular, so big props go out to the makeup and effects departments. With a total budget of only a million and a half, they defiantly seem to get their money’s worth. This is definitely a better than average entry into the vast horror market and sees the birth of two new horror icons to look forward to seeing more of, Adam Green and Victor Crowley. 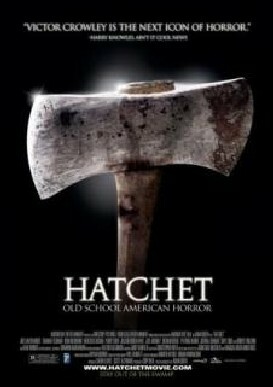 While Hatchet 2 was filmed earlier this year and made it onto a few theatres a DVD release date has not yet been set. The Rockport Review is 1 Year Old! "The Collector" is a Sleeper Horror hit!